Ponyta in game: 15,624 Who? Important notice! Pokemon Ponyta is a fictional character of humans. Ponyta is an equine Pokémon with yellow and reddish-orange flames forming its mane and tail. This fiery mane and tail grows out about an hour after hatching. Its body is mainly cream and has four long legs, each ending in a single, gray hoof. These hooves are said to be harder than diamonds. It also has extraordinary jumping abilities, and is capable of leaping tall buildings in a single bound. 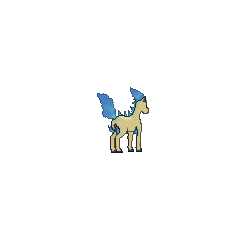 However, a newborn Ponyta is a weak runner and is actually barely able to stand. It gradually strengthens its legs and becomes faster by chasing after its parents. In the anime, it is shown that Ponyta can control its flames so that its rider is not burned by them. Ponyta runs in fields and mountains all day. Ponyta live in grasslands, on plains, or anywhere that it can run freely. 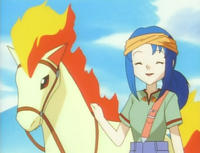 Ponyta is first seen under the care of Lara Laramie in The Flame Pokémon-athon!. Ash uses it in a race, in which it evolves to Rapidash. In Holiday Hi-Jynx, Santa Claus had Ponyta to pull his sleigh at a time before Stantler was introduced. It made another appearance in Christmas Night. Ponyta was also a member of Stella's circus in It's Mr. Mime Time. 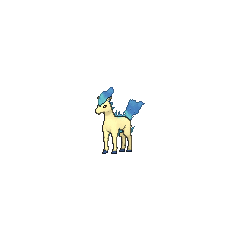 Two Ponyta were among the Pokémon seen at Professor Oak's Laboratory in Showdown at the Po-ké Corral. 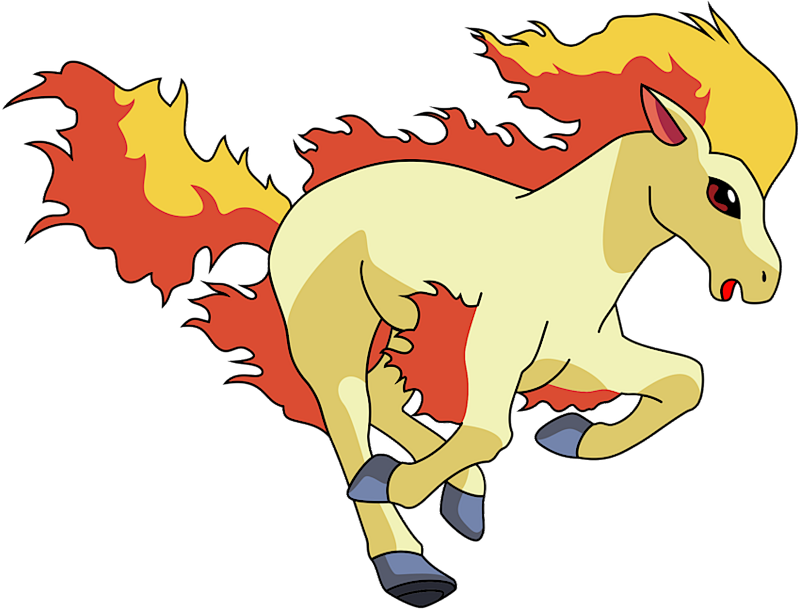 A Ponyta was one of the Pokémon affected by Drowzee's Hypnosis in Pikachu Re-Volts. Multiple Ponyta appeared in Celebi: Voice of the Forest. Wings Alexander also had two Ponyta in Throwing in the Noctowl. Little Joy owned a Ponyta in Celebi and Joy!. A Ponyta appeared in Win, Lose, or Drew! as a Pokémon in the Contest. Multiple Ponyta appeared in Odd Pokémon Out!. 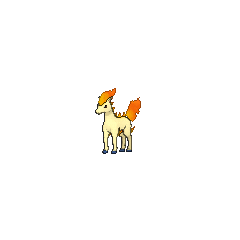 A Ponyta appeared under the ownership of an unnamed Trainer in The Ole' Berate and Switch!. An unnamed Trainer's Ponyta was traded for another Trainer's Munchlax in Throwing the Track Switch. A Ponyta appeared as a rocking horse in Seeking Shelter From the Storm!. Two Ponyta appeared during a flashback in The Legend of X, Y, and Z!, as painting on a wall. Ponyta was first seen in Ponyta Tale of the Yellow chapter of Pokémon Adventures. It carried a postman to Pallet Town to deliver mail to Red but soon went berserk until it was calmed by a Venusaur, belonging to Red himself. A Ponyta is seen in The Kindest Tentacruel where it was one of the Pokémon that Yellow was fantasizing about that was able to evolve via stone, despite it not being able to evolve via stone. Platinum also owns a Ponyta which serves her as a form of transport. Although a weak battler with nothing but a streak of losses against every Gym Leader it had faced, in Canalave City, it was somehow able to defeat both of Byron's Bronzong and evolve soon afterwards, becoming a Rapidash. Ponyta's Stadium and FireRed Pokédex entries state that it can jump over the Eiffel Tower and Ayers Rock, which exist in the real world. Tokyo Tower is referenced in the Japanese version of Stadium. Ponyta and its evolution are based on fiery steeds in mythology, such as those belonging to the Greek fake Helios, Skinfaxi of Norse mythology, or the horses of the Ashvins in Hindu myth. The fire in its Shiny coloration refers to blue fire, which generally indicates a higher temperature than orange fire but may also be caused by certain chemicals burning at a normal temperature. 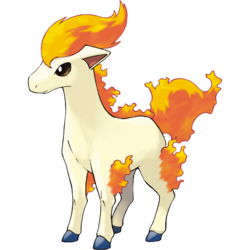 Ponyta is derived from pony. It phonetically sounds like the foreign word bonita (nice in Spanish, Basque, and Catalan; beautiful in Portuguese and Galician; goodness in Latin). It could also be a shortened form of ponytail.